I love salads! Especially ones loaded with Summer flavors. This peach salad has it all: creamy avocados, the bite of the onions, and crispy bacon over a bed of lettuce. The great thing about salads is that you can prep the ingredients the night before to take with you for lunch the next day. And since you don’t have to heat anything up, it can all go in the fridge and stay there until lunch time. When it’s time to eat, just construct your salad, pour the dressing and you have a filling meal. 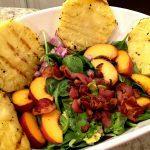 This peach salad is so refreshing and a great way to use up peaches before they get too ripe. This peach salad is the perfect summertime meal! It's refreshing and filled with the great combo of avocado and bacon. Yum! The best way to cook bacon: Preheat oven to 350 degrees F. Cover a baking sheet with aluminum foil (for easy clean up) and place the bacon. Cook for 15-20 minutes, or until crispy. Make the dressing by adding vinegar, dijon, honey, lemon juice, salt, and pepper first. Then, tablespoon by tablespoon, wish in the oil until everything is homogenous. Store in fridge until ready to serve. Cut the peaches into half moon slices. Small dice the onion. Cut the avocado into bite sized pieces. Arrange the baby spinach in a serving bowl and the rest of the ingredients. Remove the dressing from the fridge and give it one last whisk. Pour onto the salad and serve immediately.